First introduced to Congress in 2007, the Motor Vehicle Owners Right to Repair Act requires the manufacturers of a motor vehicle that is brought to the U.S. commerce to provide the vehicle owner and service technicians with all information needed to diagnose, service, maintain, and repair the vehicle. As the owner of a forklift or forklift fleet, it’s in your best interest to understand your rights as a consumer and know how you can best take care of your powered industrial trucks to maximize your investment and future productivity. Why Was the Right to Repair Act Created? Many newer motor vehicles are now made with intricate computer systems that control many of the diagnostic tools and systems. Modern computer instrumentation requires codes and special equipment to access the diagnostic information and perform the needed repairs. Without the software and trouble codes, technicians at independent repair shops are forced to turn consumers away and point them in the direction to an authorized dealer as their only option. Independent mechanics lose business and consumers often have to pay more and be inconvenienced. 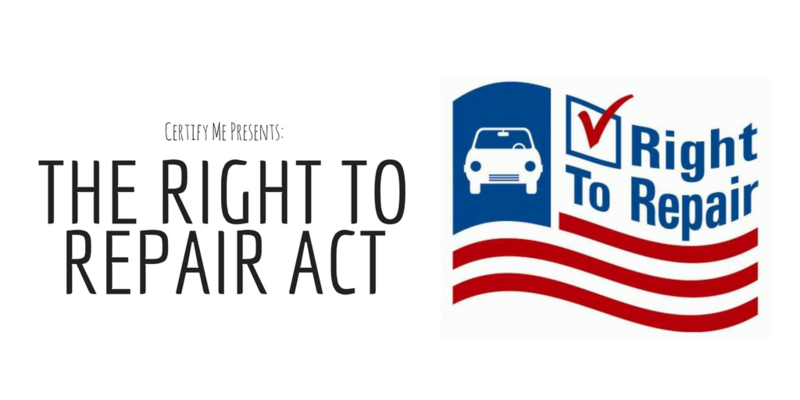 The Right to Repair Act requires that manufacturers provide all the access codes and other information to consumers and independent technicians so they don’t have to take their vehicle to a dealer. This act retains business for small repair shops and gives consumers options to where they can take their car for repairs. Does the Act Pertain to Industrial Vehicles? As motor vehicles are considered automobiles and defined as vehicles powered by an internal engine primarily for use on public streets, roads, and highways, powered industrial trucks are not included in this act. This means that, for forklift owners, you are not required to be given the access codes or other information for accessing diagnostic information. If you are a private owner of a newer forklift, you will still have to bring your truck to a dealer for diagnosing and repairs. And if you’re the owner of a construction business or fleet, your service mechanics will need to speak with dealers or complete training to learn how to access this information. As the owner of a forklift, it is your responsibility to choose the best course of action for keeping your forklifts maintained and safe for use. As required by OSHA, your operators must be trained and certified to operate forklifts. For your service technicians you rely on in your day to day business, there are many forklift manufacturers that supply training for both operators and technicians. Companies like UniCarriers Corp and Komatsu offer training that consumers can invest in for their workplace. For forklift training for your operators, check out our Training Kit on CertifyMe.net. We cover how to operate Warehouse Forklifts, Pallet Jacks & Order Pickers, and Rough Terrain Forklifts to help you build a multi-skilled workplace. Additionally, you can invest in the Train the Trainer course to train experienced operators to lead the forklift training for your new employees. Through the right training, you can create an efficient, high performing workplace that won’t become obsolete or dependent on outside services to keep your forklifts up and running.